I’ve had a lot of questions about sleep products since my stint on What’s Up Moms — by the way, did you know they are the #1 parenting channel on you tube? You should follow them if you don’t already. So we talked a lot about these products and some didn’t even get featured. So, I wanted to go into more detail about what you didn’t hear AND what you didn’t see. I’m sure I don’t have to tell you that swaddles are great for that 4th trimester where your baby still likes feeling in close quarters. But just in case you didn't know, now you do. More importantly, swaddles help keep your baby’s startle reflex at bay — which hopefully means not startling themselves awake! I absolutely love the Halo Swaddle. Many clients, including myself, have had a lot of success with the Halo. The important thing to remember about the Halo is you really want the cotton version to keep your baby cool-optimal sleep conditions! A critical part of sleep is not overheating the body. Especially in the early morning when our body temperatures naturally start to rise when we wake up. The Halo is also great for transitioning slowly out of the swaddle too. You can slowly have one arm out (do that for a few days) and then move the other out. This swaddle has a very light weighted center that mimics a parents touch, so when you walk away from your settled baby, the goal for them is to stay settled. If your baby is accustomed to you having your hand centered on their body, then this may allow you to step aside… and get a little break. The reason I don’t suggest this off the bat is many clients who have had this swaddle say it is a little difficult to use. And really you want something that is a no-brainer and one that your baby will not get out of. Many babies don’t like to be bound down with their arms by their sides. Some like to sleep with their arms up over their head. The Love to Dream swaddle allows for babies arms to stay up if that’s how they prefer to sleep, and the arms are still also contained inside. … which means no scratching their little faces. This swaddle design also takes into account a wider bottom half to prevent hip dysplasia, and the fabric is really light weight… (which you now know is great for regulating core body temperature). Baby’s will sleep a lot better if they are cool. So, if you watched the video, you saw Lizzy’s cute little man testing out the Magic Merlin. Many parents have a great experience with this suit for helping with their little one’s startle reflex. This is true. When those startle reflexes are strong, you may try anything to help with your little one’s sleep, enter the Magic Merlin. I do throw caution to the wind here. There are three things to consider. One, it’s thick. Again, we don’t want your baby to be too warm — think cool. Second, part of teaching your little one self soothing skills is having them be able to move and scoot around the crib once that swaddle is gone. The Magic Merlin prevents your little one from doing just that. Third, it can be challenging to transition out of. Meaning that once your baby is accustomed to the merlin, removing it can be challenging. It becomes another “thing” they need for sleep. My suggestion? Try to use it intermittently (if you have to use it at all) — maybe not for every sleep period. That way your little one will learn to sleep without it too! It’s important to find a white noise machine that is just that — pure static white noise. That means no other rhythmic sounds, like ocean waves, heart beat, whale noises, or lullaby music. Even though these other sounds are soothing, they actually activate our brainwaves rather than keep them at rest. So when babies are in a lighter active stage of sleep (i.e., going between sleep cycles), these rhythmic sounds can actually wake them up. Enter the Marpac-Dohm. This little white cylinder only offers pure static white noise, which means you can’t mess things up… AND it stays on all night long, helping your little one stay in a deeper sleep for longer. Win-Win. Another thing you want to think about is how loud the noise actually is. The marpac-dohm has two settings so it’s great in terms of not getting too loud. Make sure that the decibel level will not hurt baby’s ears. There is a decibel app parents can download to check. This is one very fancy bassinet. The SNOO comes as close to a night nurse as it comes. If I had the money (or was given a Snoo) and currently had a newborn, I might be curious to check it out. The SNOO bassinet essentially responds to your baby. When your baby starts crying, white noise turns on, and gentle rocking motion comes into play and helps your baby back to sleep. The catch? Your baby will probably only use it for 2–3months (maybe 4mos). It seems really cool, but also gives me pause to spend that much money for that short amount of time. The Tranquilo Mat is a foldable travel soothing mat. It’s a vibrating mat that helps soothe your little one, has ambient noise, comes in different sizes, has three different vibrating levels (low, med, high), and has a soft but firm mattress. I’d recommend adjusting vibrations around 3 months to wean off sleep associations, and set to a lower setting. You don’t want your little one to become too dependent on it. Also, there is an adjustment where you can shut it off after an hour. I absolutely love this little item. The Cusher Closer is the best thing when it comes to your doors. You wrap it around your little ones door handles, and as you sneak out of the room and close the door, the latch sound won’t wake them up! These little closers also save your doors and your ears when your toddlers start running around and slamming doors. They just can’t! 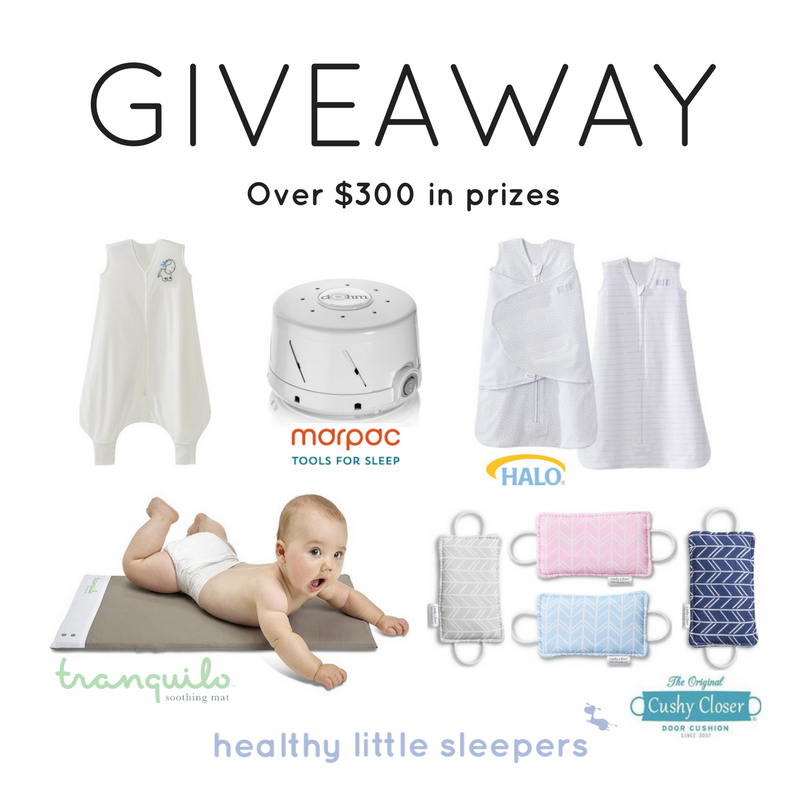 I have been lucky enough to team up with some of my favorite sleep products and have a GIVEAWAY just for you! All you have to do is go to my Instagram account and follow me and the other vendors and be entered to win. If you want help with your little one’s sleep or are wondering what you can do to provide the most optimal sleep conditions, let’s talk. I have an initial free 15 minute call. AND … guess what!?! Every other week I share 5 things on how you and your little can get the most out of their first 5 years of life in my newsletter — The Healthy Little Note. It’s free too!